﻿ Production - Poltava firm "VORSKLA-STYLE"
The number of VORSKLA employees is 530 people. Most of them are women - 93%. Today the factory is a high-performance clothing manufacturer with modern technologies and equipment. There is a full range of women outerwear: jackets, trousers, dresses, skirts, short coats, coats, knitwear. Onsite experimental base: Computer processing of the modeling process and CAD layout patterns, INVESTRONIKA software. 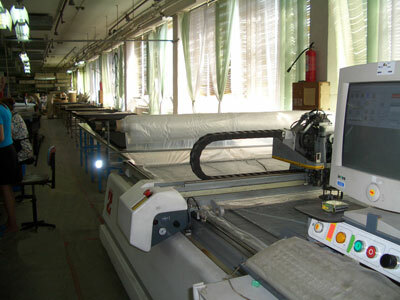 Sewing lines are equipped with Pfaff, Strobel, Siruba, ZOJE equipment as well as specialized equipment: hand stitch sewing machine, Pegasus knitting machine, embroidery machine with 6 heads, Sussman and Rotondi irons, VeiT ironing work places, ironing press of closed armhole seam, ironing of the sleeves shoulder girdle. Autonomous steam providing system produced by steam generators of the Sussman and Rotondi companies. Automatic tables for cloth measuring, Weiss. Automatic cutting system, Invescut Quartz. A set of automatic production management software was introduced in the company. The total area of production facilities is 6 500 m² (square meters). The company capacity is 40 thousand units per month. 9 sewing streams, 30 people each, work at the clothing factory. Individual technological and professional approaches allow us to create high-quality clothing at all levels of production, from cutting to final wet-heat processing. Professionalism of the personnel allows the company to constantly improve technological processes and introduce new technologies.